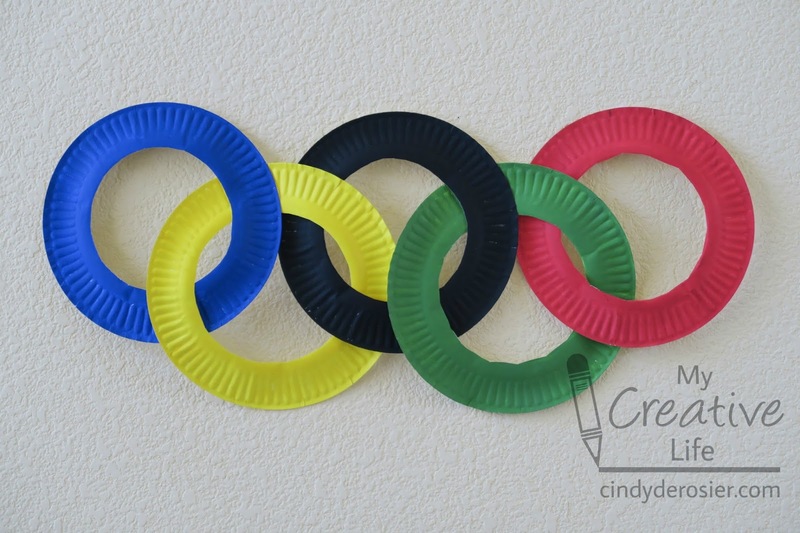 You may have noticed that this is the 3rd Olympics-related craft project I've shared in the past two months. (You can see my Olympics bracelet here and the Edible Olympics Rings here.) While it is an Olympic year, my main motivation for all this Olympics crafting is because that was the theme Trevor chose for his birthday party. 1. Turn the paper plates upside down. Paint the back of each plate one of the five colors. There's no need to paint the center area, as you'll be cutting it out. Let the paint dry completely. 2. Cut out the centers of the blue, black and red rings. Do this by poking a hole in the plate and then cutting from there. You want these three rings to be completely intact. 3. Cut out the centers of the yellow and green rings by cutting ONCE into the side of each plate, then removing the centers. These two rings will have a single cut in them. 4. 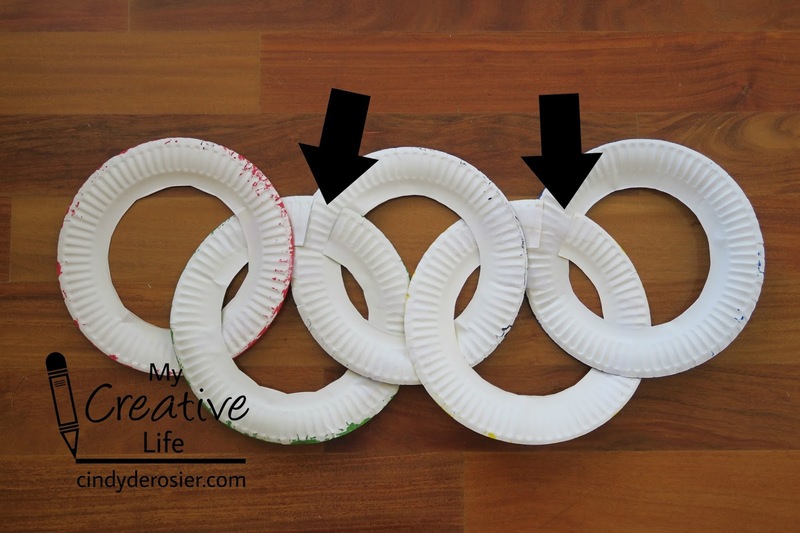 Using the above photo, interlock the paper plate rings to mimic the Olympic flag. Gently turn it over and tape each intersection. There will be a slight gap (see arrows in the photo below) in the yellow and green rings. It won't show from the front. I'll be sharing more from the Olympics party the rest of the week. Ohhhhhhhhhhh I love this! What a great idea!!!!!!!!!!!!!!!!!!!!!!!!!! I really love this project! You did a great job describing how to put it all together. I can't wait to see the next posts. Olympics? Well that's certainly a different theme! Bet it was difficult to find (any) decorations; it's a good thing his mama is crafty!